Sphingidae (and several other moth taxa) play a critical role in many ecosystems – that of pollinators. Pollination is a mutualism – an ecological relationship where both partners get a benefit. The pollinator gets food in the form of nectar (and sometimes pollen) from the flower, while the plant gets pollinated – that is, it is fertilized and can go on to produce seeds that will grow into the next generation of plants. 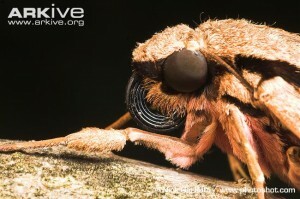 Since moths lack jaws and possess a proboscis as a mouthpart, they don’t eat any of the pollen that collects on their bodies when they visit flowers. They use their proboscis to collect nectar only – this is in contrast to bees and beetles that directly consume pollen as well as use it to provision their nests. 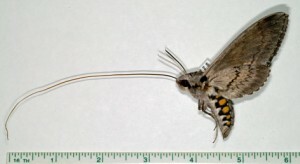 Hawkmoth probosces can be very long – in some cases several times the length of the moth’s body. Later I’ll do a post on a famous example of this. 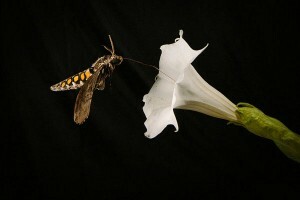 Hawkmoths can’t visit just any flower to drink nectar. Since the majority of hawkmoths are nocturnal, they are restricted to visiting flowers that are open and producing nectar at night. Most people are aware that some species of flower close at night, but did you know that flowers can produce varying amounts of nectar depending on the time of day? Flowers visited by hawkmoths also tend to be white (or very pale yellow or pink), colors that are easily visible to moths flying in the dark. Hawkmoth-pollinated flowers also tend to be heavily-scented, as these insects have evolved excellent olfactory systems to locate flowers at night – they can detect scents from flowers up to a few kilometers away! Because of their long probosces, hawkmoths have trouble accessing nectar in flat, open flowers (for example a purple cone flower or similar). They generally to visit flowers with a long, tube-like shape. 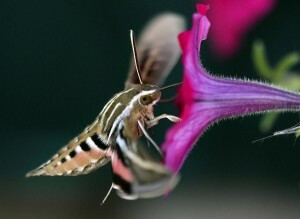 Hawkmoths are attracted to flowers that produce large amounts of nectar. As I mentioned in a previous post, hawkmoths are capable of hovering flight, which requires a lot of energy. That energy is provided by the sugars in flower nectar. Now, from the moth’s perspective, it’s getting a reward in the form of nectar from a flower. But what is the flower gaining by employing a moth as a pollinator rather than using a bee, a hummingbird, a beetle, etc? 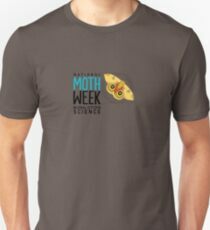 As I mentioned earlier, hawkmoths can be long distance fliers, often traveling several kilometers in one night in search of nectar. This means that pollen is carried further away from the plant in which it originated, potentially leading to increased genetic diversity for the plants. Additionally, since moths don’t eat or groom away any of the pollen that collects on their bodies when they visit a flower, any pollen on them has the potential to be deposited on the next flower, rather than being lost. Another reason why plants might employ a nocturnal moth pollinator is because there are fewer flowers and fewer pollinators available at night, since the majority of flowers are open and pollinators are pollinating in the day time. This means that flowers can potentially reduce the chances of receiving pollen from the wrong species of plant (which won’t lead to the production of seeds). 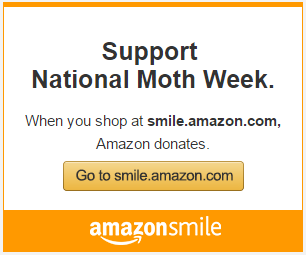 Moths don’t pollinate any of our food crops, however, they do pollinate many native and garden plants. Take a look in your garden or a nearby garden to see if you can spot any potentially moth-pollinated plants! If you’d like something specific featured on the blog, or would like to submit a blog post for us feel free to reach out to the NMW team. As always you can follow us on Facebook and Twitter! I disagree with your comment that hawk moths do not pollinate food crops. I observed one the other night in my raspberries doing a very complete survey to ensure all fruit was set. There is no lack of other flowers for it to choose but it stayed on the berry bushes. Love these moths and the interesting plants they pollinate. I grow Datura plants for my own enjoyment and to attract Sphinx Moths to my garden. What specific flowers do you recommend? I live in Robertson County, TN. Thanks. 70 years ago in southern Oregon, I loved going outside summer nights and one of the treats were the giant hawkmoths. I didn’t learn they were pollinators until much later but they were wondrous, hovering rackety creations of nature. Love these little critters. Have a lot of native plants in our gardens and enjoy seeing them forage. It’s always a great treat to see a hawkmoth in action! What many people don’t realize is that the despised tobacco hornworm(I grew up calling them tomato worms) which many a gardener kills on sight, is the caterpillar of the hawkmoth. So, if you’ve a garden, and the tomato worms are a munching on your ‘mater leaves, take heart, for they are just baby hawkmoths.